In this case, “little brother” has six national football titles and an enrollment of 51,000, yet still craves respect. Meet Michigan State, the nation’s ninth-largest university, with a rich football tradition that still ranks a distant second in its own state to archrival Michigan. How distant? This year, the Spartans spent the final game of the regular season at Rutgers, while the Wolverines were playing their annual grudge match with Ohio State. Spartan fans are accustomed to that, but they got another slap in the face the next day when the bowl pairings were announced. Expecting to play on New Year’s Day in the Outback bowl in Tampa, the 19th-ranked Spartans (9-3) were snubbed in favor of – wait for it – an 8-4 Michigan squad that MSU beat 14-10 on the road. The reasons were familiar: Michigan is, well, Michigan – even if MSU has beaten the Wolverines in eight of 11 meetings under coach Mark Dantonio. 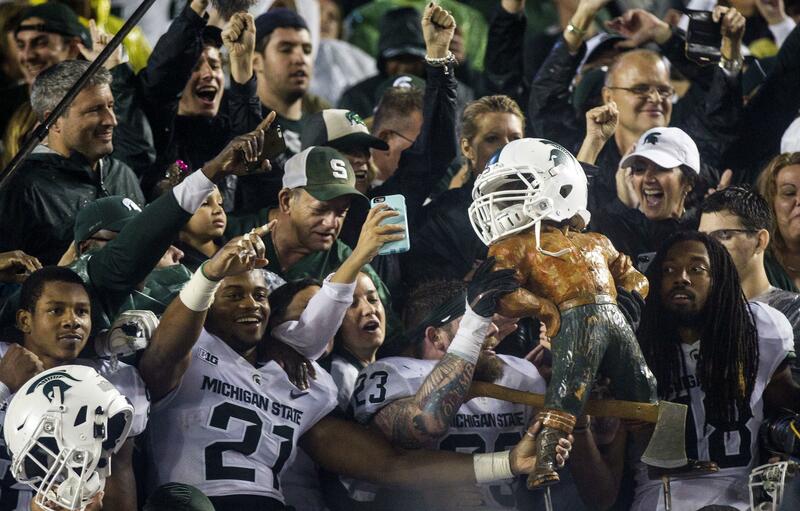 The Spartans were vocal about the snub. Five days later, they still couldn’t hide their disappointment and being shipped to San Diego and Thursday’s date with Washington State. “It was kind of the fact that the other team that we beat got into the one that we kind of wanted to get in. That was just the biggest thing.” Brian Lewerke said. Harbaugh countered with sarcasm: “Congrats on turning around a 3-9 team plagued with off-the-field issues,” he Tweeted. Just as the Cougars took their lumps from Gil Dobie and the Huskies early in the 20th century, Michigan State was getting pummeled by Fielding Yost’s “Point-a-Minute” Michigan teams. There was humiliation off the field as well for MSU, which wasn’t admitted to the Big Ten Conference until 1953. As part of an unequal deal with Michigan, the Spartans got to host their rivals six times in the first 52 meetings. But times were changing. MSU enjoyed its greatest success under legends Biggie Munn and Duffy Daugherty during the 1950s and 60s, winning six national titles (though only three, in 1952, 1965 and 1966) are widely recognized. Over the next four decades, MSU managed to reach just one Rose Bowl. Dantonio turned things around with nine bowl appearances in 11 years, including a Rose Bowl win in 2014 and an appearance in the College Football Playoff two years ago. Published: Dec. 23, 2017, 7:10 p.m.